I don’t expect that many of my readers will know of Preston. It is a small town on the very northern limits of the industrial north west of Britain. If it is known at all, I suspect its chief fame lies as being something of a landmark on the journey north on the motorway: after Preston the ghastly and almost continuous urban sprawl of Central England is left behind and the Lake District fells begin to beckon. It is a town that I have known from school days so I reckon I’ve been acquainted with it for a rather staggering 45 years. We were there last weekend (my parents live nearby) and walking through I was struck by the contrast between the Victorian buildings and those created during the last half century. 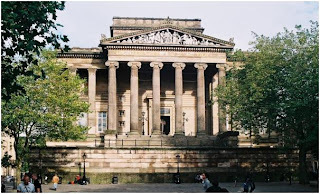 I should explain that Preston was an important textile town in the 19th century (its motto is ‘Proud Preston’) and like so many of our northern cities acquired a civic architecture appropriate to its status as a global leader in industry. I’m afraid I’ve had to borrow some photographs off the web but this is the Harris Library and there are a number of other civic buildings of similar scale and quality. 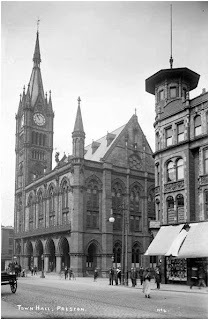 Although Preston survived the Second World War without any major damage from bombing it lost a very fine town hall due to fire in 1947. But much remains: even some of the smaller Victorian chapels display a striking solidity. Now what struck me in my stroll was how all this contrasted with what had been created during the near half century that I have known Preston. In my time I have seen the arrival of shopping arcades, out-of-town centres, car parks, bypasses and the odd sports ground or two. But there is nothing built to last. Indeed, the massive but now rather shabby concrete bus station built in my youth is now about to be torn down and replaced. This is all rather striking given that the last half century has been a time of almost unparalleled prosperity. Yet as I looked around I found myself wondering where all the wealth had gone. What have we done with the money? Where are the civic improvements that you might expect? I do not believe Preston’s experience is unique: quite simply we do not seem to build anything in the same way these days. This of course raises the question ‘why?’ Why do we no longer build majestic buildings that we expect to last for at least a couple of centuries? Why are our buildings – with a few exceptions –temporary, ephemeral structures whose best claim to fame is cheapness and functionality? I suspect you would need to be both an architectural and a cultural historian to really pin down all the causes and I am neither. But let me make some suggestions: I think there are several technical factors that have come together. There are technological changes. Steel, concrete and glass produce a very different building style. We go for lightness and space rather than solidity and weight. With the ever more rapid changes in technology there is no point in building for the future; we all know of old buildings where we cannot fit in insulation, double glazing, fibre-optic cable or even enough electrical power points. In a world where the future is imponderable, the answer is simple: don’t build for the future. City centres are not the permanent features that we thought they might be. In Britain the Second World War was very salutary in this respect. The conventional bombing of Coventry and Dresden demonstrated that large-scale urban destruction was possible; the nuclear bombing of Hiroshima and Nagasaki that total urban destruction was possible. With the rise of the motor car city centres began to lose their central importance. The peripheries became more important. Yet there are also I think cultural and philosophical issues worthy of consideration. So for a start, we don’t do ‘civic’ architecture on this scale anymore because we don’t have their values. The elevation of market forces means that cheapness is all. One of the sad maxims of earthquake damage is that educational buildings generally collapse quickly. The reason is that they are thrown up quickly by councils whose agenda runs no deeper than providing a service for voters. There are no votes – only increased costs – in building for centuries.The western world has become dominated by an ideology which centres everything around the private individual as consumer. With such a worldview why take the time to build major and imposing buildings for the community? Instead we create what is effectively consumerist architecture: and here a building is surely like the packaging around an item; effectively disposable. Yes, there has been a massive growth in wealth but it has been largely diverted back to private individuals and private wealth. We have consciously – or subconsciously – chosen cheap holidays and new cars over faster rail systems, expanded civic libraries and imposing town halls. You could almost say ‘If you want our monument look in our garages’. The thing that is striking is that some of this short-term consumerist ethos has found their way into the church. In the Old Testament we see the Jewish people moving from the temporary tented Tabernacle to the solidly imposing Temple. In what we are and what we stand for we seem to prefer the alternative trend. There is something troublingly lightweight, flimsy and ephemeral about much of our worship and teaching and yes, our, buildings. In many ways I am troubled by the massive chapels of towns like Preston and of many Welsh urban areas. They are impractical and hard to maintain. Yet in their construction I see things that I find missing today: a confidence, a hope in the future, a desire to make a lasting statement about values. In a way that we do not, they had faith. There has been a certain bemusement in the UK recently over the sudden American preoccupation with the British National Health Service. I followed the debate with some interest: these are important issues. I also have some familiarity with the private system: when we were in Lebanon the system was totally private. The result was that at the entrance of the American University Hospital casualty department two sombre signs were posted . The first read something on the lines of ‘No guns allowed beyond this point!’; the second, ‘Medical Insurance Essential’. Immediately beyond the signs was an armed guard and a cashier’s office to ensure that both these entry criteria were met. Anyway, I have to say that most Brits I know were pretty indignant about the NHS being trashed on US television by those opposed to Obama’s health care reform package. Passing over the ridiculous assertion that Professor Stephen Hawking would not have been kept alive by the British system, when that is exactly what it has done, our indignation was aroused on a couple of counts. The first is that on the whole the British system works very well, and when it comes to accidents and emergencies, extremely well. We get the odd horror story but in general the system is really very good at what we call A and E. One of its big plus points is that when you do get ill or injured the only thing that matters is the medical process. If you hear someone in the UK say ‘I can’t afford to get ill’, 99 times out of 100 what they mean is ‘I can’t afford to take time off work’, ‘I’ve a wedding to attend’ or ‘It’s the big match coming up’. It is also very good for long-term care. As some of you know, our first grandson (now a thriving one-year-old) has a major hormonal deficiency that will require him to be on replacement steroids and to have regular health checks for the rest of his life. The total financial cost to him and his parents of this condition is zero. Well given that all three of them have enough to deal with anyway, there seems a degree of justice in the state shouldering some of the burden. I don’t mind my tax money going to that. The second point of indignation centred on our perception of the existing US health system. Not having much experience of this, I do not wish to comment too much but it is a generally accepted truism that whenever you go to the States you make sure you have good health insurance. There is much that Americans may legitimately take pride in but I have never heard any American boast of their health system. There is also much muttering in the UK over the perception (note, I choose my words carefully) that the protest against health care reform was being funded by the vested interests of the healthcare industries. Maybe I’m getting unusually cynical, but I too tend to take the old policeman’s rule that when faced with a crime, you ask ‘who benefits?’. My second concern, and I know it is shared by many people, is the extent to which we should bail out those who have effectively brought upon themselves self-inflicted injuries. I knew someone who courtesy of illegal steroid use during weight training destroyed his knees and put him and his family at the mercy of the state forever. A very large number of injuries received in our excellent accident and emergency wards over the weekend come about as a result of excessive alcohol abuse. And do I need to mention sexually transmitted diseases in unhealthy life styles? I do wonder if we had a private medical system, as we do with car insurance, such people would lose their ‘no claims bonus’ or its equivalent. But a totally free system is inevitably open to abuse. Anyway I have no easy answers; the eternal Christian dilemma of balancing generosity and justice, fairness and forgiveness, persist. But I would cautiously suggest that, in both the UK and the US, we really need to do some careful and compassionate thinking about the way ahead. There’s a lot that I could blog on this week, from family matters to healthcare policies, but I want to continue the theme that was picked up last week: that of language. One of the fun things of struggling with another language (and I never do more than struggle) is that, like looking in a mirror, you see familiar things very differently. Now God doesn’t play a major part in French culture. Voltaire and others had good go at ejecting him around the time of the French Revolution and he never really seems to have made much of a comeback. You get the impression that, in popular French Catholicism, the ‘Blessed Virgin’ and the ‘Saints’ tend to occupy what we might call the spiritual ecological niche that Father, Son and Holy Spirit fills in Protestantism. Certainly all the evidence is that if God is at all considered in the French mindset he is as a very remote and distant character. So with that all in mind, it comes as something of a surprise when, reading a French Bible you see that God is addressed in the intimate tu form. On and off this week I have been trying to find out through the Internet and a French teacher friend something of the origins of this peculiarity. What transpires is that the Protestants seem from fairly early days to have used tu to address God while the Catholics didn’t. This caused some animosity and heightened the religious divide between them. The Protestants were held to be overly familiar; they seem to have retaliated by saying that the Catholic use of vous could mean that they believed that God was not one. Given that Bible reading was not actually approved of in Catholicism until 45 years ago, the debate was probably quite academic. However at the Second Vatican Council (1962-65) papal approval was given firstly, to reading the Bible and secondly, to using the informal manner of address. So things are changing: nevertheless, some French Catholics have never adjusted and still resolutely use the vous form of God. After all, the argument goes, isn’t it inconsistent to address the Virgin Mary as vous but to address her Boss (so to speak) as tu? This leads back to the fact that we used to have a similar problem in English with thee, thou and thine. Thee took the place of the French tu and was used for close friends and social equals and inferiors. You/ye and yours were reserved for those of higher social status. (There is a very good Wikipedia article on it). Apparently it had largely fallen out of use by around 1650 in southern Britain so all those historical novels set in the Civil War with them thee-ing and thou-ing are probably incorrect. As an aside, it has persisted in North English dialect until the present. Growing up in Lancashire it was very common to often hear people addressed as thee: as in “I’ll get thee a cuppa’ tea” and “where has tha’ been?” Being totally lacking in linguistic skill (grammar of any sort was starting to die out in the 1960s) I only now realise that it was restricted to use between friends and in the singular form only. The curious irony is, of course, that many people assume that the use by the Authorised Version (KJV) Bible of thee and thou is to indicate a respectful distance between us and God. That was not the meaning: far from it. In fact, the issues here are not entirely linguistic; it’s the old dilemma of familiarity and respect. Because neither Hebrew nor Greek uses this T-V distinction we don’t have a pattern to go from. In this respect English Bible translators have much less of a problem: they don’t have to choose. I suppose using the tu form in prayer is something one would learn. How suitable you would feel it was, would probably depend on how you felt you stood in respect to God. If you see God as your Heavenly Father then the family tu form would no doubt seem utterly sensible. But if you see him as Lord then I presume vous would seem more appropriate. A final comment here. In the Lamb among The Stars the Assembly worlds speak the artificial Communal. In case anyone asks I have no real answer as to whether that language would have preserved the T-V distinction. The issues of familiarity and respect, of God being Father, Friend and Lord are, this side of glory, not easily resolved. This is the phenomenon that has been called Globish (pronounced globe-ish), a word which I will avoid because it seems to be a patented term with a particular philosophy behind it. ‘Global Basic English’ may be a better term. But whatever you call that there is no doubt that the phenomenon of English-Lite it is here and is increasingly widely used as a functional lingua franca across the world. It is able to deal brutally with tenses so that past, present and future simply become ‘I go to town yesterday’, ‘I go to town today’, ‘I go to town tomorrow’. Plurals are created simply by adding an S to anything. You identify the subject of a sentence by simply saying ‘I’, ‘me’, ‘you’, ‘they’. Sentences are kept short. Vocabulary is reduced; some people say to as little as 1,500 words. Adjectives can be put before or after the noun and are very limited: ‘big’, ‘small’, ‘cheap’, ‘expensive’, ‘many’, ‘few’. Word order is astonishingly flexible. Anything remotely clever or subtle like puns, humour, sarcasm, irony, nuances or ambiguous words is avoided. On the whole I welcome this. Ever since Latin stopped being the language that every civilised gentleman and lady used we have been waiting for something like this. It’s not quite the end of the curse of Babel but it’s better than mutual incomprehension. Some people however object to this on the grounds that it is the triumph of American and English culture over the rest of the world. I am not so sure: the whole point about Global Basic English or whatever we call it is that it does not replace the native language. It is hardly going to be the main language of any culture. It is not easy to be romantic in it for a start and it is hardly suitable as a language of politics: for that you need a language in which it is far easier to mislead people than in stark, plain GBE. One of the key proponents of Globish is French and he sees it as being the salvation of the French language; I can see his point. Two observations. First, if the rise of Global Basic English is at all threatening, it is threatening to native speakers of English. On the one hand, it is we who are most inclined to be misunderstood by our use of complexities and nuances that others eschew. On the other, there will be a danger that High English will be corrupted by the presence of its debased English-lite offspring. One teacher grumbled to me this year that he felt some of his native English speakers were incapable of using past, present and future tenses correctly. And this was at A level! And of course the fact that you can universally be understood with a subset of your native language is not exactly going to encourage us to master French, German or Spanish, let alone the really difficult languages of East Asia. The second observation, which does have a spiritual significance, is that in some respects we have been here before. Scholars point out that classical Greek which was venerated by every civilised man because of its flexibility and great literary tradition, gave rise to a vulgar offshoot, Koine Greek. Koine Greek (which eventually acquired a much greater subtlety than Global Basic English has at the moment) became the language of tradesmen and the marketplace anywhere where the Greeks had once ruled; which was pretty much most of the Mediterranean and well over as far as Mesopotamia. It seems to have coexisted with classical Greek.